The Warsaw University of Life Sciences (WULS) is the oldest agricultural academic institution in Poland, one whose history dates back to 1816. Today, the university comprises 11 faculties and 6 interfaculty units. There are 25,000 students currently enrolled and they can choose from 23 disciplines and 61 specialties. 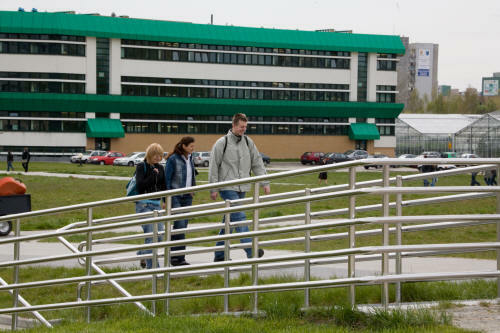 The new campus of the Warsaw University of Life Sciences is located in the Ursynów District of Warsaw. The University authorities are seated in the Palace of Julian Ursyn Niemcewicz, but the whole campus encompasses a large number of faculty buildings, student dormitories and facilities such as the Sports Centre, SGGW Hotel or the Main Library. There is also the special-purpose building with a conference hall, better known as the Crystal Auditorium, where the most celebrated academic events take place. At the Warsaw University of Life Sciences (WULS), the EURECA courses will be offered by the Faculty of Human Nutrition and Consumer Sciences. The Faculty of Human Nutrition and Consumer Sciences was established in 1977. Today, it employs over 100 academic and technical staff members, including 12 full professors, and there are over 1000 students (full‑time, external, evening-class and doctoral ones) enrolled in its courses. The Faculty is authorized to award Master Engineer (MSc, Eng) and Doctor of Philosophy (PhD) degrees, as well as to conduct postdoctoral degree conferral procedures. It also boasts a fully-computerized library with vast collections of Polish and international literature, indispensable for the teaching and research activities. The Faculty collaborates with a number of Polish and foreign/international organizations, such as IUNS, EANS, PHARE or FAO/WHO, in the scope of both student and staff member exchange schemes. Moreover, it routinely participates in symposia, seminars and congresses as well as in international research and training programmes, often taking up the role of the event organizer. Notably, the Faculty representatives are involved in the activities of numerous non-governmental organizations. The concept of the Faculty’s operations and its further development has always emphasized and still emphasizes its interdisciplinary nature, yet with a focus on food and human nutrition with their socioeconomic, technical and ecological aspects. The Faculty continuously develops its educational activity and research studies on the links between nutrition and health and the quality of life, including the assessment of food products in terms of their pro-health aspect as well as the needs and behaviour of consumers in relation to the quality of food they eat and of catering services. The issues of household economics and food market functioning in Poland as compared to other member states of the European Union are also being looked into. In this scope, the current training and study programmes are modified and new ones are developed, within the framework of strong international collaboration. Last but not least, Faculty members are actively involved in the widespread propagation of knowledge on human nutrition and household management.